Abundant life! What a gift! But what is it? An abundant life is a life without need. You don’t need to find food, because you have food. You don’t need to find water, because you have water. You don’t need to find a place to live, because you live somewhere. You don’t need to find a job. You have one. It doesn’t mean you have millions of dollars. We think “abundance” and we see dollar signs. I think that’s America. But abundance is much simpler than that. Abundance is having enough, plus something for somebody else. If you have enough, and you have extra, then you live in abundance. Clean water is abundant life. 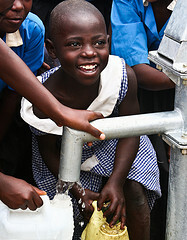 We saw the joy clean water brings when Generation Alive built a well in a Ugandan village. Sometimes we struggle to understand the simplicity of abundance because we live in a consumer culture. It’s hard for us to see it, but consumerism can actually kill people. We get caught up in buying stuff that we don’t even need, while there are people around us who will literally die if they don’t get our help. That’s the situation we’re in. I know people are going to tell me, “Well, Jeremy, you have stuff.” And it’s true. I mean, I have an iPad, an iPhone, and a laptop. I can access the internet with three different devices, all at the same time! Do I need to do that? It’s probably excessive. But I’m not saying that we shouldn’t have anything. I’m not saying that you should never buy anything for yourself. I’m only saying that we also need to have a mindset to help someone in need. If our drive, our heart, and our focus is simply to make sure that we have what we need, then we have the wrong heart. If we’re always thinking about what we want and what we’re going to get, and at the same time we don’t have a thought for anybody else, then we’re being shallow. We have the wrong mindset. Jesus came so that we might have life, and have it more abundantly. When He came, He gave us the message, He gave us the example, and He gave us abundance in Him. When He left, these things didn’t leave with Him. He gave them to us so that we’d live accordingly. Now we are His ambassadors! So if we are to represent Him, we need to focus our minds and hearts on bringing abundance to others.